Whole Circle Farms, Inc. shall not be held liable for the medical claims made by customer testimonials. The statements made regarding these products have not been evaluated by the Food and Drug Administration. The efficacy of these products and the testimonials made have not been confirmed by FDA- approved research. These products are not intended to diagnose, treat, cure or prevent any disease. All information presented here is not meant as a substitute for or alternative to information from health care practitioners. Please consult your healthcare professional about potential interactions or other possible complications before using any product. The Federal Food, Drug, and Cosmetic Act requires this notice. Except to the extent that such warranties or representations are implied by law and cannot be excluded, Whole Circle Farms, Inc. makes no warranty or representation regarding the quality, currency, accuracy, reliability, performance, completeness or fitness for purpose of any part of the information and content on this site, or on any pages or sites linked to this site. In particular, Whole Circle Farms, Inc. does not represent or warrant that the information and content on this site, or the facilities that make it available, will not cause damage, or are free from any computer virus or any other defects or errors, or that your access to the site will be uninterrupted. To the maximum extent permitted by law, Whole Circle Farms, Inc. is not liable (whether in contract, negligence or otherwise) for any loss or damage arising from the use of this content and information. By making a purchase you are demonstrating a clear understanding that we are selling these products as containing CBD (cannabidiol) from hemp oil and or Hemp Flower. These statements have not been evaluated by the FDA and are not intended to diagnose, treat or cure any disease. Always check with your physician before starting a new dietary supplement program. We are committed to complete compliance with FDA regulations and as such, because these products have not been evaluated by the FDA, we make no claims as to any benefits for products containing CBD (cannabidiol). If you decide to purchase our products, you are purchasing these products with the understanding the present status of CBD (cannabidiol) products. Please email info@Wholecirclefarms.com or call 503-873-7976 to resolve any issues you have with product purchased. We do offer a 30-day, no questions asked return policy. Mail any unused product to Whole Circle Farms within 30 days of purchase to receive a full refund. No return merchandise authorization is needed; the customer is responsible for return shipping costs.Whole Circle Farms, Inc.
Once we receive your package at our facility, we will issue a refund for the full amount. Refunds will appear on your bank statement within 3-7 business days. If you have any questions regarding our return policy please email info@wholecirclefarms.com. This license shall automatically terminate if you violate any of these restrictions and may be terminated by Whole Circle Farms at any time. Upon terminating your viewing of these materials or upon the termination of this license, you must destroy any downloaded materials in your possession whether in electronic or printed format. The materials on Whole Circle Farms’ web site are provided “as is”. Whole Circle Farms makes no warranties, expressed or implied, and hereby disclaims and negates all other warranties, including without limitation, implied warranties or conditions of merchantability, fitness for a particular purpose, or non-infringement of intellectual property or other violation of rights. Further, Whole Circle Farms does not warrant or make any representations concerning the accuracy, likely results, or reliability of the use of the materials on its Internet web site or otherwise relating to such materials or on any sites linked to this site. In no event shall Whole Circle Farms or its suppliers be liable for any damages (including, without limitation, damages for loss of data or profit, or due to business interruption,) arising out of the use or inability to use the materials on Whole Circle Farms’ Internet site, even if Whole Circle Farms or a Whole Circle Farms authorized representative has been notified orally or in writing of the possibility of such damage. Because some jurisdictions do not allow limitations on implied warranties, or limitations of liability for consequential or incidental damages, these limitations may not apply to you. The materials appearing on Whole Circle Farms’ web site could include technical, typographical, or photographic errors. Whole Circle Farms does not warrant that any of the materials on its web site are accurate, complete, or current. Whole Circle Farms may make changes to the materials contained on its web site at any time without notice. Whole Circle Farms does not, however, make any commitment to update the materials. 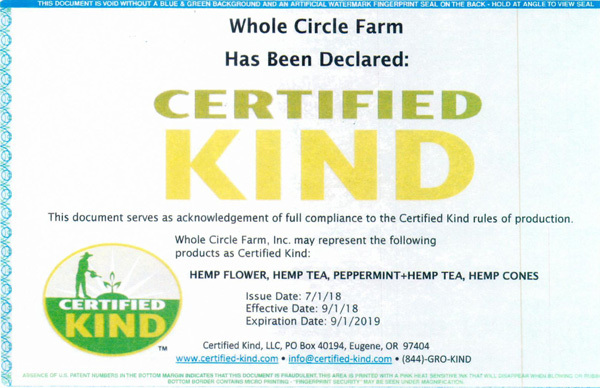 Whole Circle Farms has not reviewed all of the sites linked to its Internet web site and is not responsible for the contents of any such linked site. The inclusion of any link does not imply endorsement by Whole Circle Farms of the site. Use of any such linked web site is at the user’s own risk. Any claim relating to Whole Circle Farms’ web site shall be governed by the laws of the State of Oregon without regard to its conflict of law provisions.